In 1914 the treatment of Prisoners of War was governed by the Hague Convention of 1907. Article 4. Prisoners of war are in the power of the hostile Government, but not of the individuals or corps who capture them. They must be humanely treated. All their personal belongings, except arms, horses, and military papers, remain their property. Article 7. The Government into whose hands prisoners of war have fallen is charged with their maintenance. In the absence of a special agreement between the belligerents, prisoners of war shall be treated as regards board, lodging, and clothing on the same footing as the troops of the Government who captured them. It is fair to say that at the outbreak of war none of the belligerent powers had given much consideration as to how these obligations were to be met. Germany was in particular difficultly. As the conquering power, thousands of military and civilian prisoners were falling into its hands and she had neither the accommodation nor administrative arrangements in place to cope. Prisoners were dispersed across Germany to be housed in any available buildings, regardless of suitability; these included Barracks and race courses. These places had to be guarded and the prisoners fed and clothed. Arrangements fell woefully short of Convention obligations. As 1914 ended and 1915 opened, prisoners writing home were reporting being in dire straits due to lack of food and clothing. The situation resonated with the families of the men of the Wiltshire Regiment. The Regiment had two Battalions in the field. Each had entered France or Flanders at full strength of about 1100 men apiece. By the end of October 1914, 2nd Battalion was reduced to about 150 effectives, 500 men were wounded and 450 men were prisoners. Some 250 men of 1st Battalion were also prisoners – so some 700 prisoners were in German hands. Even before the prisoners’ difficulties were known, Mrs Frances Ellen Forbes, wife of the captured Officer Commanding 2nd Battalion, had been gathering food and clothing for the prisoners, though as yet there were no established method of sending parcels. This support to the ‘fourteeners’ (as the group was known) gathered pace and continued through 1915 and 1916. In the Autumn of 1916, owing to the very unequal distribution of help from England, the Government altered the arrangements for the care of British prisoners in enemy hands. All individual packing of parcels was forbidden and the care of prisoners was entrusted to the Central Prisoners of War Committee in London under The British Red Cross and Order of St John Society. The Regimental Comforts Fund, now under the day-to-day leadership of Mrs Alexandrina Ryrie Steward, feeling confident that the necessary funds would be forthcoming, decided to continue with the care of the Wiltshire Regiment men and applied to retain the responsibility. The administration of the Regimental Comforts Fund was of high standing and the Central Prisoners of War Committee agreed at once. The existing Committee at Devizes became the Wiltshire Regimental Care Committee, responsible for consigning all parcels for the Wiltshire Regiment and without whose consent no organisation could pack for the Wiltshire Regiment. The Committee’s responsibilities now included the prisoners in Germany, internees in Holland and Switzerland and the front line Battalions in France, Flanders and the Middle East. In November, 1916 it was estimated that £17,000 would be required for 1917 and the Urban and District Councils of the County were invited to seek subscriptions from their area. To the great credit of the Wiltshire communities this target was exceeded. 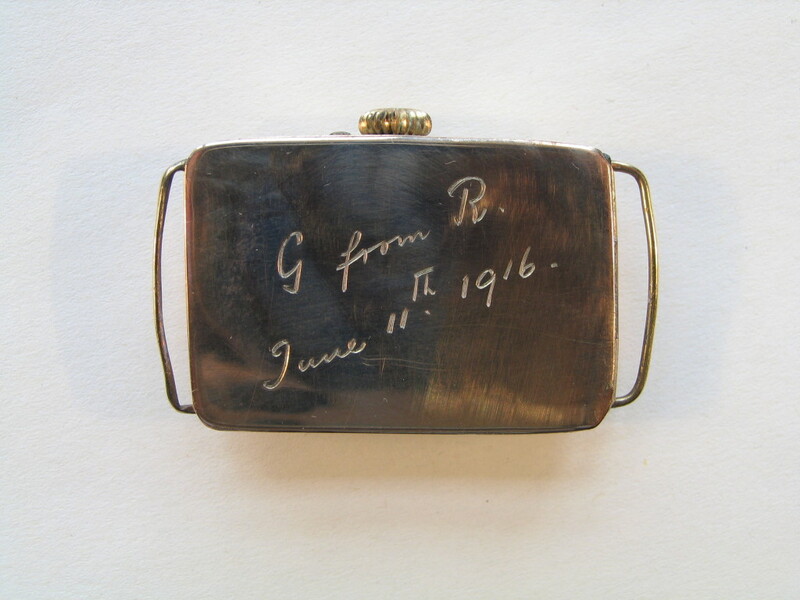 The Wiltshire Regiment Care Committee gave authority to pack to the existing County Committees at Salisbury, Swindon, and Warminster, and to other Committees at London (Lady Dodd’s Committee), Cheltenham, Frome, and Dundee, and, for a considerable portion of 1917, to Mr. E. G. Trump, of Sidmouth. During 1917, packed by a volunteer force numbering several hundred at Devizes, Salisbury, Swindon, and Warminster, nearly 58,000 parcels of food were despatched to prisoners, of which over 28,000 were packed at Devizes. Twice a year each prisoner received a complete outfit (including uniform, boots, and underclothing). Article 16. Inquiry offices enjoy the privilege of free postage. Letters, money orders, and valuables, as well as parcels by post, intended for prisoners of war, or dispatched by them, shall be exempt from all postal duties in the countries of origin and destination, as well as in the countries they pass through. Presents and relief in kind for prisoners of war shall be admitted free of all import or other duties, as well as of payments for carriage by the State railways. Each parcel was addressed to a specific individual who was asked to acknowledge receipt by returning a card. The numbers of acknowledgments received was sufficient to provide assurance that the delivery arrangements were satisfactory. Rationing was introduced in Great Britain yet the Committees continue to source and to purchase as cheaply as possible whilst maintaining the required high standard of contents. The target cost was 6 to 8 shillings per parcel. The initial success of the German Spring Offensive (Kaiserschlacht) brought further demands for the Care Committee. The Wiltshire Regiment had the 1st Battalion, 2nd Battalion and 6th Battalion in the field and each lost heavily. 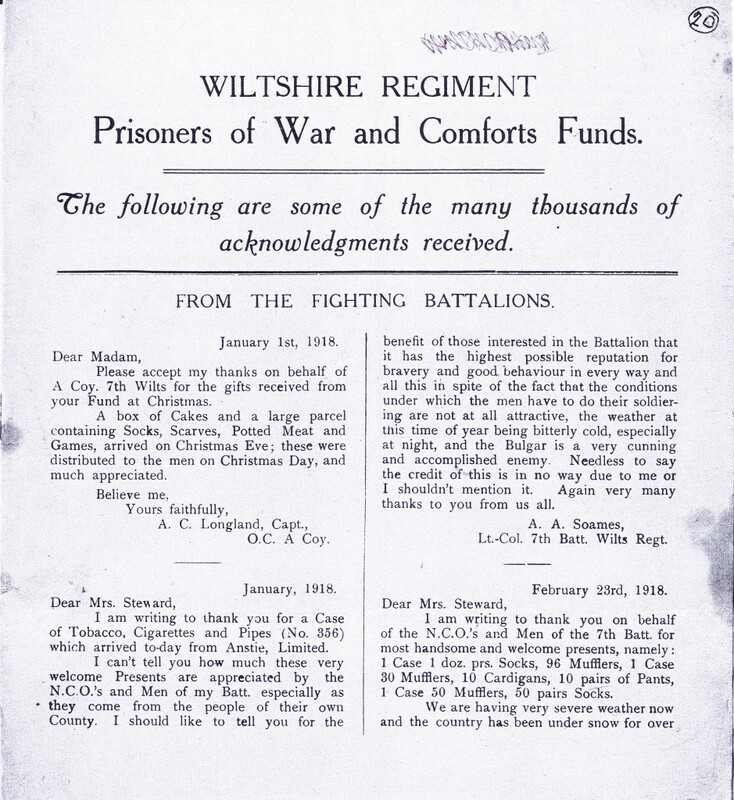 These new prisoners (the ‘eighteeners’) posed great difficulties for the Care Committee, now entitled Comforts Fund for Wiltshire Regiment and Prisoners of War, for a parcel could not be despatched until the location of the prisoner recipient was confirmed. For a considerable number of prisoners there was great delay in confirming the place of incarceration. 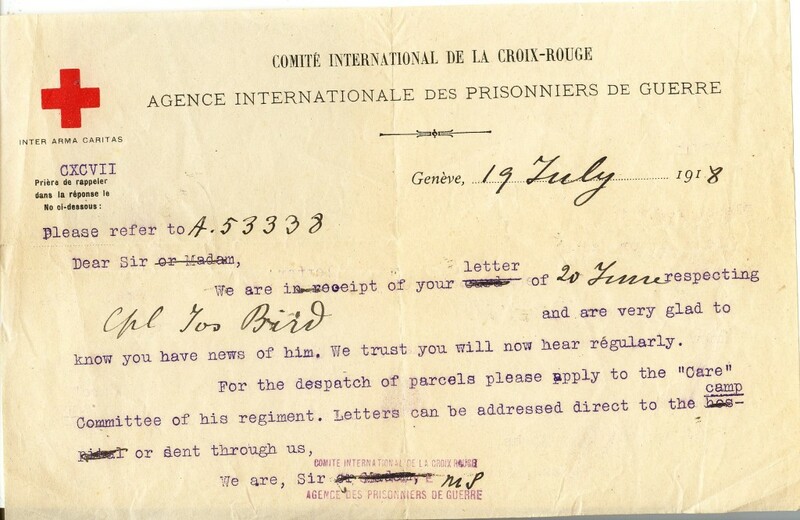 This caused great anguish for families because although the prisoner could confirm through a simple field post card that he was alive and whether he was ‘sound’, ‘wounded’ or ‘ill’, his location could only be confided via the International Committee of the Red Cross. Consequently many ‘eighteeners’ waited months for a Regimental parcel and relied on the official parcels supplied via the Red Cross. Regimental support continued after the Armistice as prisoners were gathered in from around Germany. By January 1919 repatriation was substantially complete and the Central Prisoners of War Committee directed that all despatches were to cease and Committees were to be properly wound-up. Although very much in the public eye at the time, the work of the Wiltshire Regiment Committee is now largely unremarked, but since it undoubtedly saved many lives it deserves to be remembered. For her leadership of the Wiltshire Prisoners of War Committee, Mrs Alexandrina Ryrie Steward was appointed to the Most Excellent Order of the British Empire for services in connection with the war (New Years Honours List 1919, London Gazette, 8 January 1919). Alexandrina Ryrie Steward died on 4 September 1949 aged 84 years and is buried in Bishop Cannings Churchyard, Wiltshire. If you have information on the work of the Wiltshire Regimental Care Committee the Rifles (Berkshire and Wiltshire) Museum will be delighted to hear from you. Please contact The Archivist, The Wardrobe, 58 The Close, Salisbury, SP1 2EX. Tel: 01722 419419. Research: Richard Joyner and Christopher Bacon. 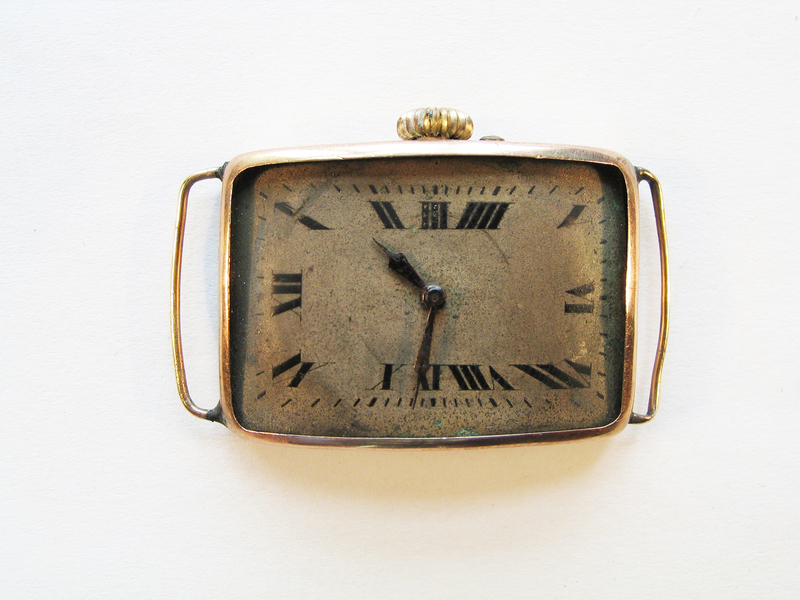 Lieutenant George Philip Oldfield, (2nd Battalion, (captured 24 October 1914), receives this watch for his 21st Birthday. Smuggled in the knuckle of a leg of ham the contraband eludes the German search of newly delivered parcels. After searching the parcels are quarantined so that time-sensitive items and messages will expire. 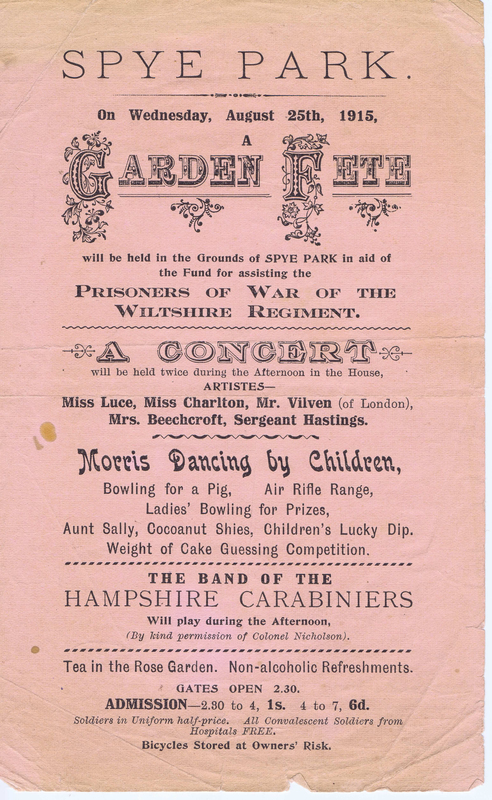 The Fund for Prisoners of War of The Wiltshire Regiment holds a fundraising concert at Spye Park, a large country house near Lacock. 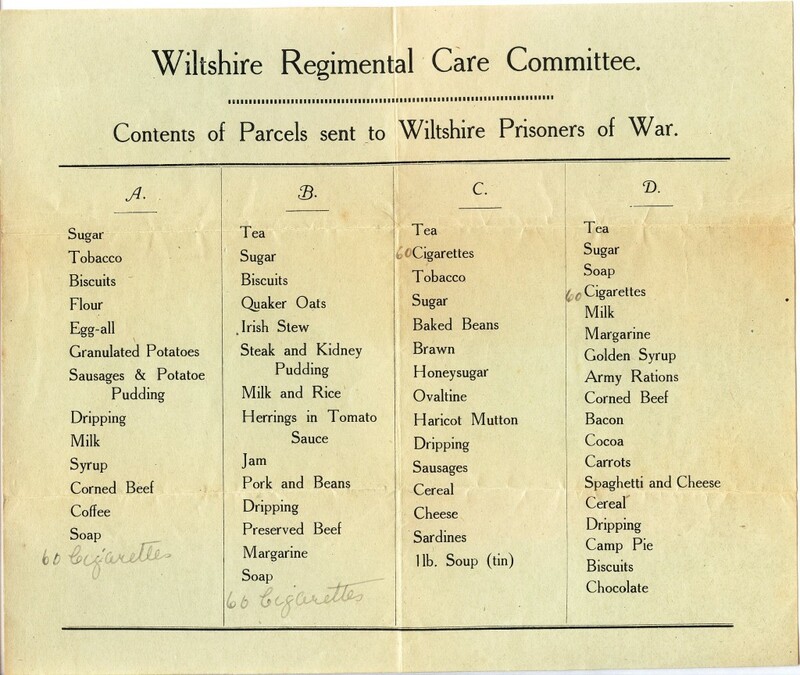 The Wiltshire Regimental Care Committee offers four choices of parcel content. Relatives select the option that they feel will best suit their man. Beneficiaries of parcels acknowledge and thank the Wiltshire Care Committee for the parcel(s). These letters provide evidence that the parcels are being received by the intended recipients. 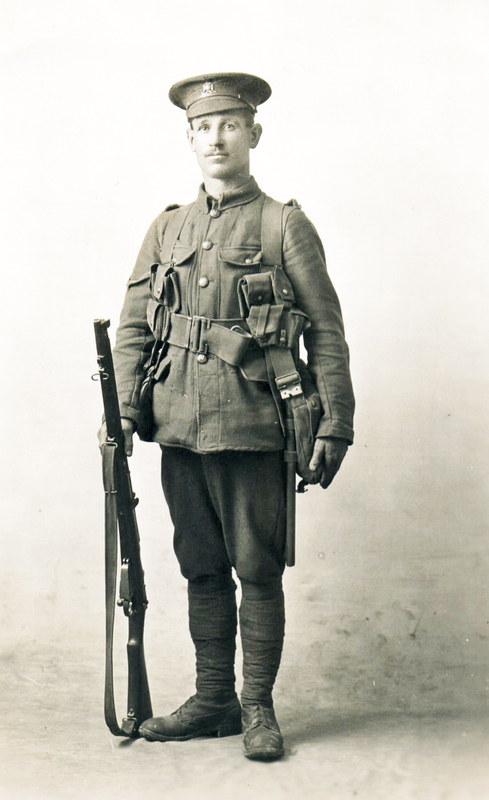 James Bird, recipient of a care parcel, poses in his Service Uniform possibly immediately after mobilisation. The equipment is of the new pattern webbing material and he carries a .303 inch Short Magazine Lee Enfield Rifle. The uniform colour is khaki is of durable material The tunic is ill fitting and newly worn – note the stiffness of the skirt of the garment. His hat is of the pre-war style with its crown stiffened by a wire band. The style swiftly lost appeal in combat conditions because the crown made the wearer conspicuous even when the body had been expertly camouflaged. 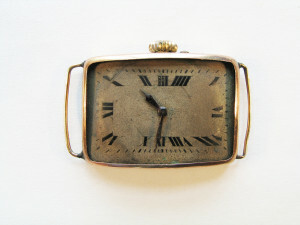 The band was usually discarded and the profile of the crown manipulated to soften the outline. Notice that James Bird is ‘safe’ as a Prisoner of War.